The May MADE Show features art and gifts for Mom. 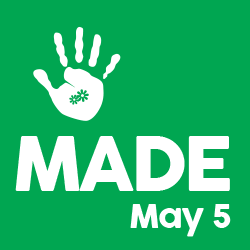 MADE is May is just one week before Mother’s Day! MADE. Sunday, May 5, 2019. Indoors at Chicago’s Morgan Manufacturing in the West Loop, the on trend venue for what is current. MADE will be open for showing and selling from 11 am – 5pm. Notification of status will be emailed to each Maker directly with the email provided on the application. Accepted artists will be required to submit their booth fee payment by April 1, 2019. Applications received after April 1, 2019 will be required to submit their booth payment within 3 days of email notification date. If the booth fee is not received by the deadline date, the artist may forfeit his/her participation in the festival. Invited artists will be required to submit their booth fee payment by April 1, 2019. Applications received after April 1, 2019 will be required to submit their booth payment within 3 days of email notification date. If the booth fee is not received by the deadline date, the artist may forfeit his/her participation in the festival.